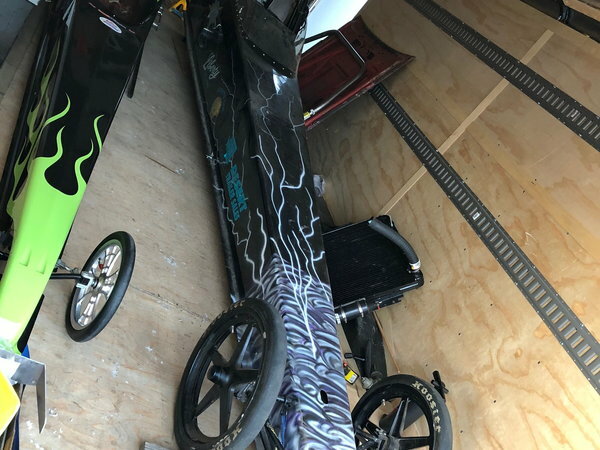 Rolling Neils and Parks rear engine dragster with BBF motor plates. Last certified to 7.50 but has expired. All electronics are still in the car. Cage is for a larger driver, 22 inches wide. Chassis has 233 inch wheelbase, 22 ft 8 inches is the overall length. New front tires included. Also have BBD motor plates and upswept headers for $400. 2 speed powerglide with fresh rebuild, Reid casing and BBD bell housing. $3500. Prices are in Canadian funds.